The last week has been pretty relaxing. I have spent a LOT of time practicing, and I am starting to record some new music at the Palau, including a song I am going to give to Creative Spotlights for their Charity Fundraising Album, and one I plan to submit to Berklee’s brand new A&R club. I’m very proud of this new material, and I’ll try to make it available to listen to ASAP. Hola Berklee! My name is Alexis Colett from Fresno, California and I’m a second-semester Vocal Principal studying Professional Music and minoring in Drama. I am currently studying in Berklee Valencia’s undergraduate Global Studies Program, concentrating in International Music Business and Performance. 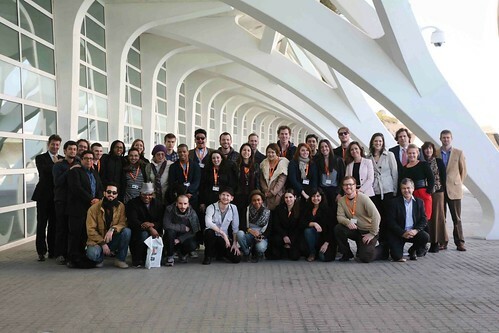 This semester I will be blogging about my experiences at Berklee Valencia. Putting together a new school in a foreign country is not an easy task. There are many aspects to it: developing a new curriculum, building the facilities, hiring new staff and most importantly, finding the right students! I am proud to say that I am studying with 26 of some of Berklee’s most dedicated students. What you learn in the classroom is one thing; however, it is what you can gain from your peers that is so enriching.